An absolutely stunning range of Italian designer woven leather bags for the discerning fashionista who can appreciate quality and craftsmanship. 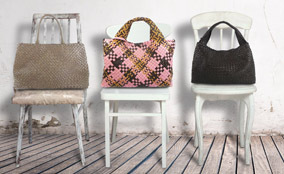 Hand crafted entirely in Italy by artisans and sourced for their design, quality and authenticity, this range of bags offer a touch of La Dolce Vita. With great brands like Fontanelli, Paolo Masi and Carbotti to choose from you're bound to find that perfect bag.